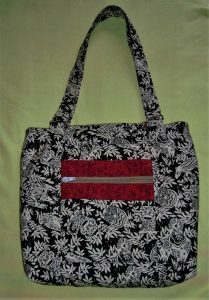 I usually make a demonstration bag when tutoring a workshop and it often happens that the sample does not quite make the cut at the end of the day. 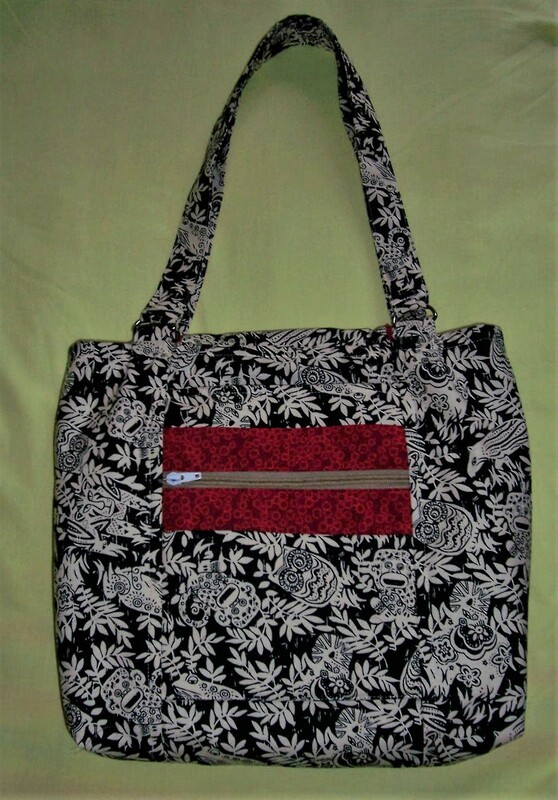 For the Carousel Tote bag workshop I had prepared a bag using some remnants of fabric that were originally purchased for a Sewing Organiser (http://www.craftsy.com/lecture/introduction-and-everything-in-its-place-bag/8179.html) that a great friend made for me to give to another great friend! 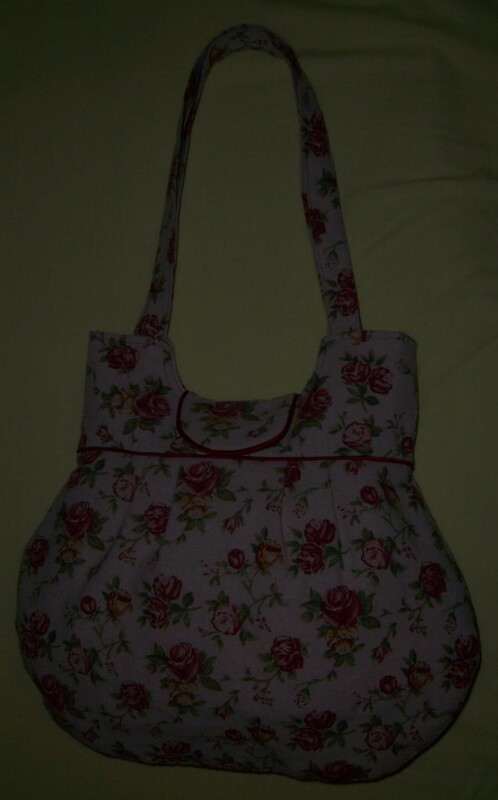 There was just sufficient to make the tote bag but on the day of the workshop it did not get finished. Now it is and as I plan to visit my friend mid-August I will save it to give to her when I visit. 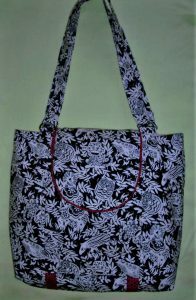 When preparing for the Simplicity 2396 Tote Bag class – I was delighted to discover that due to the width of the fabric, I had sufficient for TWO bags. I managed to complete one on the day of the workshop and this afternoon have completed the second. 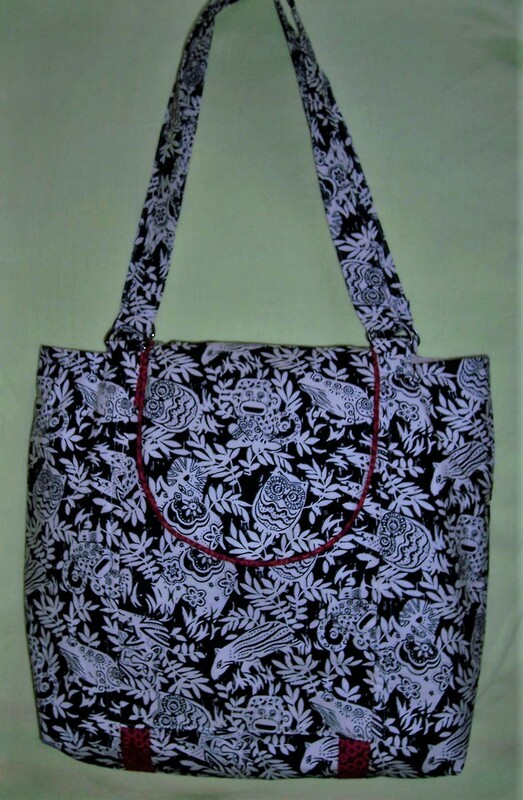 This version has the added accents of contrast piping on the joining seam between the main bag and the bag band and also around the “fussy cut” tab. Both bags have my signature pockets inside – one divided slip pocket plus a zipper pocket with slip pocket behind. The second bag also has a loop with key chain so that those important keys do not get lost in the depths of the bag! 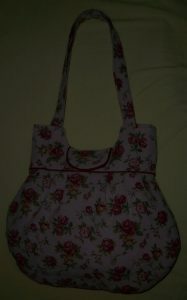 I shall be sending one bag to my sister for her birthday in October and keep the other for me.